Scream stands in front of Moria refugee camp, March 2017. / Photo by Talitha Brauer. I first met him in Moria refugee camp in Lesvos, Greece in November 2016. Scream (22) is stateless. 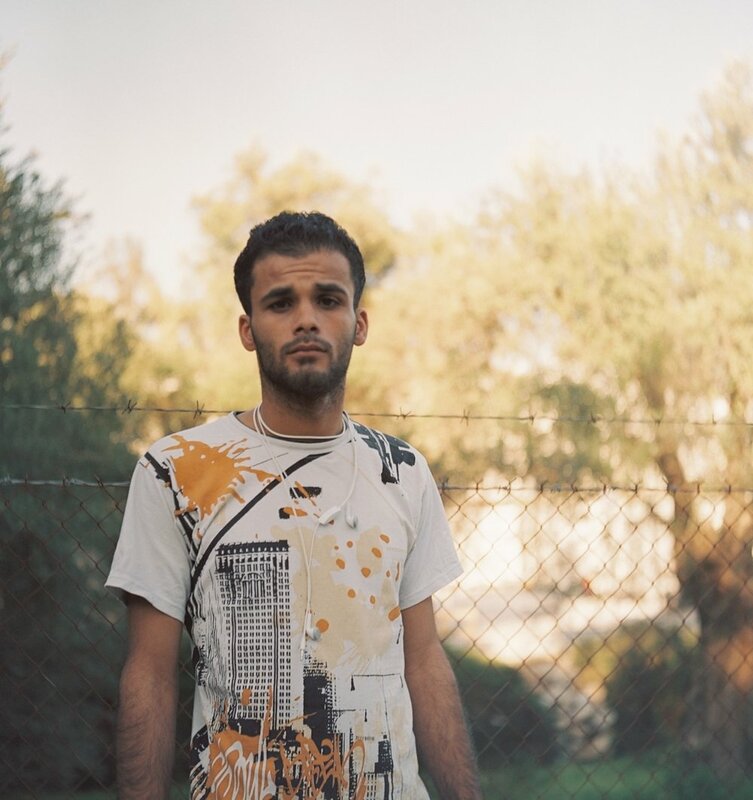 He is Palestinian, was born and raised in a refugee camp in Syria, fled to a camp in Lebanon for safety as a teenager, became a rapper there, picking up the nickname Scream from the guys who taught him how to rap, because at first he was "just screaming all the time." He spoke out against the government (asked by a TV station interviewing him), fled Lebanon through Syria (paying off those who had a price on his head) and then traveled through Turkey. His father and younger brother had already fled to Germany at this stage. Unbeknownst to each other, Scream and his older brother were both in the same coastal town in Turkey, trying to get to Greece. His big brother arrived on Lesvos 15 minutes before midnight - before the law changed. The EU-Turkey agreement was signed and came into effect 18 March 2016. Scream arrived a few days after. He and his brother reunited in Moria refugee camp. His brother, although older, was able to move quickly on and reunite with the family in Germany. Although Scream was the reason his family had fled, he was not eligible for reunification because he arrived in Greece after the March Accord at the age of 21. He was stranded in Moria for 9 months before being transferred to Athens. During this time he learned English from the volunteers and began volunteering himself as a translator with Eurorelief. He especially loved working with and helping the families in the family compound and an exception was made so that he could stay there with them. He picked up a new nickname during this time: The President of Moria. In March 2017, Scream left Athens to join me in Lesvos and help translate for myself and journalist Perla Trevizo as we reported for Al Jazeera on the story of two families (Greek & Iraqi) living under the same roof. In between research, I recorded Scream’s own perspective, just three months after he himself left Moria refugee camp. Scream describes life as a single man in Moria camp. November 2018 ~ Scream now lives in Germany. After he arrived in summer 2017, he was placed in a city 5 hours away from his family. He spent the last year learning German, and visiting his family as often as he could. Three months ago, he got his first job in Germany and this month, he can finally move to live in the same town as his family.